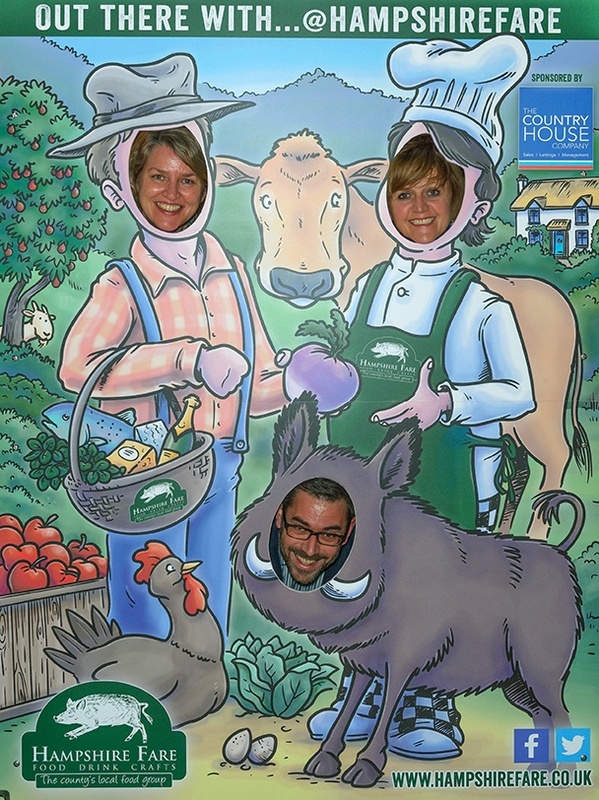 Hampshire Fare, the not-for-profit group promoting local food and drink, asked us to create a photo opportunity board. They champion over 350 producers, venues and shops, so they had a very specific brief that required the illustration to incorporate as many elements as possible, allow for three face holes, and be suitable for easy construction/collapsing and transportation. Working together with Splash Display, a bespoke unit was designed that made the building and moving of it possible, so all that was left was to create an illustration that featured branding, social media messages and logos, a producer and a chef, examples of produce and livestock, a sponsorship logo and relevant cottage, and a cartoon realisation of Hampshire Fare’s hog. Fortunately, this sort of detailed drawing is something we enjoy getting involved with! The result was revealed at a recent Hampshire Fare networking event at the White Star Tavern in Southampton, where plenty of Hampshire Fare members took full advantage of the new board. Look out for it around Hampshire at events in the coming year.